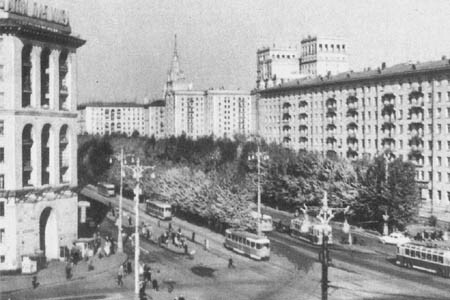 A tramline from Kaluzhskaya Zastava to the new huge building of the Moscow State University ("Universitet" in Russian) began revenue service on September 6th, 1954. It carried students, professors, as well as all who lived in new districts built here. 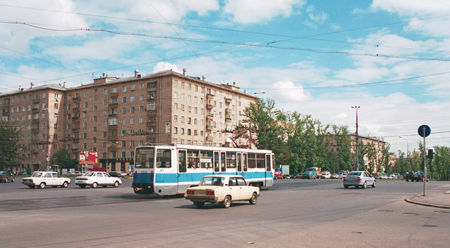 In a few years, a Metro line came to the University and farther to the south-west of Moscow, but tram service was highly demanded, and the line continues to be one of the major traffic links here. The Universitet terminus is rather large, it has four tracks. 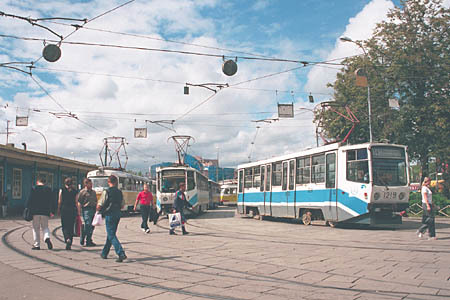 Here you can find a number of tramcars waiting while their drivers have a lunch. The station's building (blue, in the left) was constructed in 1956. 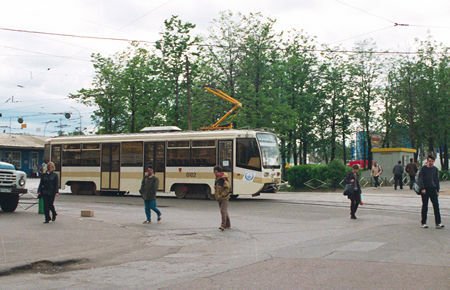 The unique tramcar 71-621 begins its trip from Universitet terminus. 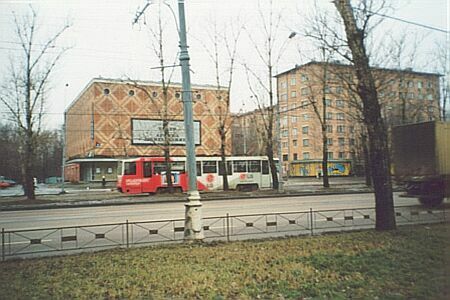 Lomonosovskiy Prospekt, viewed from Universitet tram terminus. Those buildings were raised in 1953-1959, and modern city shape replaced fields and swamps. This former cinema is now a Armen Djigarkhanyan Theatre. A picture from the book published in mid-1970's. This is a view of Lomonosovskiy Prospekt from a crossing with Leninskiy Prospect. 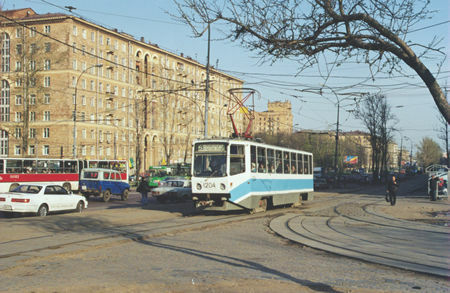 Note the tramline and the same T-3 tramcars as run in Moscow currently. The same crossing, but now viewed from another point. A special setting of rails with rubber slabs allows for motorcars and trucks smoothly cross the tramline at up to 120 km/h (70 mph).